If you have a medievalist in the family and are wondering what to get them for the upcoming holiday season, then you have come to the right website! Here are our picks for great gifts that have a little medieval in them. I’ve started my own collection of these pieces – based on the 12th-century items, carved in walrus ivory, which were discovered in 1831 on the Isle of Lewis. You can see most of the real ones at the British Museum, and on their website you can buy them as well, either as individual pieces or in sets. Something for the kids – this book is really A Different Medieval History! Created by Stephen Shapiro, the book combines visually appealing infographics, whimsical cartoons and lively, informative text. Aimed for ages 9 to 12, if this book doesn’t get them interested in the Middle Ages, nothing will! From the Cloisters section of the Metropolitan Museum of Art, this nice accessory is based on the Shepherd and Shepherdess Making Music, a wool and silk tapestry fragment from the early 16th century. 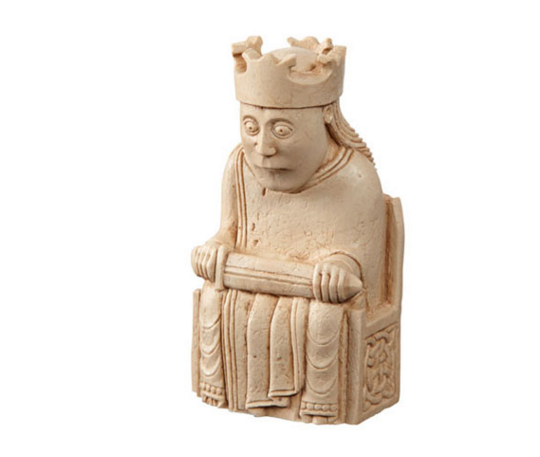 You can see that and other items based on The Cloisters collected on the Met’s Online Shop. While medievalists need to wait until next year for this highly anticipated game to come out, if you want to get them something now, a couple of promising choices are Stronghold Crusader 2 from Firelfly Studios and Chivalry: Medieval Warfare by Torn Banner Studios. There are a lot of options for buying jewellery – either replicated from medieval pieces or inspired by the Middle Ages. Etsy is a good website for finding handmade items. You can also find on the British Museum Online shop this Viking Opal & Blue Brooch, based on a design from the late Viking Age. While we don’t like the practice of buying individual pages from medieval manuscripts – since they often come from books that are deliberately cut up and destroyed – we do encourage buying facsimiles of medieval manuscripts. For high quality facsimiles, check out the websites for Facsimile Finder and Moleiro. The prices for these will go into the hundreds and thousands of dollars, but you can find many beautiful works. If you want to spend even more money, you can find some sellers of original manuscripts on this page.